Today it is the 30th birthday of the legendary Commodore 64 home computer. It was on this date that it was first revealed to the public at the CES (Consumer Electronics Show) in January 1982. It was to become the best-selling single personal computer model of all time, which is a gigantic achievement. I remember the Commodore 64 mostly for its amazing library of games. Do you remember smash hits like Commando, Gauntlet, California Games, Rambo and IK+? I sure do. 🙂 It was (and still is!) a great machine for gaming, no doubt about that. 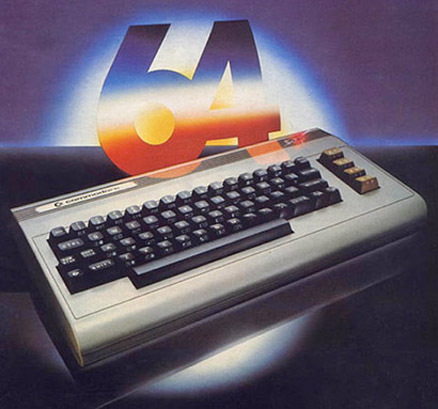 To celebrate its birthday, here’s a TV-commercial for the Commodore 64 from 1982. It was uploaded to YouTube by a user calling himself Holmes3000. Hope you’ll enjoy it! Happy birthday to this beautiful computer! I never could afford it back then, but most of my friends had a C64. So it was just a matter of visiting one and waiting for my turn to play. I remember countless hours of Rambo, Giana Sisters, The Last Ninja, Oslo Børs.. Ah, the memories! Why do I miss renting videos on VHS and loading games from tape so much? Help! Hi there Mads! I agree with you. The Last Ninja is a great game with excellent music. Same goes for Giana Sisters. 🙂 I’ve never played Oslo Børs though. Is that a stock-broking game?